Last week Chris and I flew to Florida just as a nasty ice storm was hitting Houston. It was perfect timing. The only problem was our direct flight from Houston to Ft. Lauderdale was cancelled, with no explanation. We scurried to figure out how to get to Florida in the hours of the morning before most gate counters were open in the airport, but Chris was able to get us on a flight to Tampa leaving 10 minutes after our original flight and then connect to Ft. Lauderdale later. We arrived over 2 hours later than we’d wanted, and then spent nearly an hour trying to figure out where our luggage was. It actually made it to Tampa but in the hour and a half layover it couldn’t make it directly across the same terminal that we’d landed in. Once that was straightened out (we had to go back that night to pick it up once it arrived), we made a beeline down I-95 for Miami. We were going to hit up Fairchild Tropical Botanic Gardens, one of our favorite places in south Florida. It’s my favorite botanic garden next to Marie Selby in Sarasota. The only problem was we only had about an hour to case the place and see our favorite plants. As we arrived in Miami-Dade county itself we, at first, got the reminiscent feeling of nostalgia creeping up…plus everything was so lush! How had we ever left here? It wasn’t long until we were brought back to reality and remembered exactly why. It was crowded, traffic is absolutely awful, and in general the people aren’t all that nice, especially when driving. The first time someone honked the millisecond the light turned green, we went ‘ohhhhh, yeah, people do that crap here’. We’d conveniently blocked that out, along with the random blocking of intersections, cars cutting in line because they think traffic laws don’t apply to them, and then cross-traffic continously running red-lights when your light is green. We must have been spoiled by southern friendliness too, as we said hello to the neighbor of our friend Eliana as he was checking his mail and we got this blank stare back at us. In general we’re not overly fond of cities, but there’s a big difference in cities that are friendly and cities that don’t put off that vibe. There were just many little things that were very ‘only in south Florida/Miami’ type things that drove us nuts. I’m also pretty sure I wouldn’t like New York City for any extended period of time. Aside from remembering the weirdness of Miami, we did quite a bit of exploring outside of the city. Our first full day there we went kayaking on the Loxahatchee River with our friend Tom, aka: Gator Man in the geocaching world. That was incredibly peaceful! Another day we went and checked on our ghost orchids to see how they were faring. Chris had been in the summer of 2011 but I hadn’t been since January of 2010, before we left Florida. There had been a couple of freezes in south Florida since then and we wondered if there had been any plant loss. Luckily it seemed that most of the orchids were doing well, though there were definitely some that had died. When we had originally did our plant count we’d found 607 individual ghost orchids in the slough. Obviously we didn’t have time for a comprehensive count this time around. The biggest thing was how high the water was for this time of year. The Florida Trail thru-hikers have had it rougher than most as there had been more rain this winter in south Florida than usual and the water levels had not dropped. In the slough the water level was quite high, too; usually it would have only been towards the middle with any significant amount of water, but not this time. We also got the chance to see a couple of our friends over in Ft. Lauderdale, Randy & Kathy, and Robert. For most of the remainder of our time we spent three solid days and two nights at Fakahatchee Strand taking part in their yearly Central Slough Survey. It’s a time when trusted professional botanists and amateur plant enthusists assist the park biologist, Mike Owen, in getting a habitat update on certain rare and endangered epiphytes and try to search for plant species that haven’t been found in decades. Some of these plants are thought to be extirpated but due to the remoteness of the swamp it is difficult to really know. In 2009 Chris discovered a patch of Cyclopogon elatus that had never been recorded in the park, but also that the species hadn’t been seen in Florida since 1980. Now everyone is on the hunt for a couple of remaining species, but no big discoveries were made over our weekend in Florida. We however did see this cutie that is at the top of the page, a rare and threatened Everglades mink. I’d felt like we were going to see a panther this weekend, but we didn’t. Instead we did get a mink. Previous to this year mink spottings were uncommon. This, oddly enough, was our third mink. The first two happened to be on Alligator Alley east of the Miccosukee reservation in 2009 when Chris spotted roadkill thinking it might be mink, only to have it confirmed a minute later when one ran across the highway. You can see more of the that description in the link. 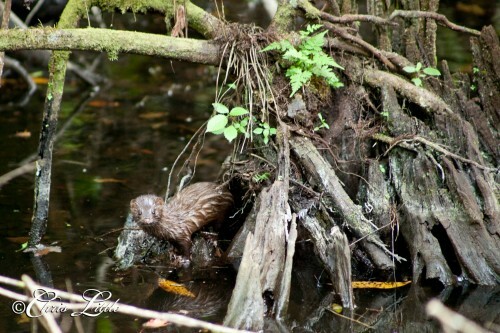 Anyway, the mink sightings in Fakahatchee right now could mean a: the population is actually increasing, b: the water levels stayed higher this year providing more prey or good habitat for them where they are located, or c: there just happens to be a den in this one location at the moment and likely everyone is seeing the same couple of mink. It could be a combination of all three, but likely it is probably just c. The trouble there just isn’t a lot known about their population size. The trip wasn’t quite long enough as we didn’t get to all of our favorite haunts in south Florida, much less anywhere else in the state! The trip certainly made me miss Florida quite a bit! Of course as soon as I got home I was happy to be home in my yard once again, but I might be pining for some of the wild places in Florida just a little bit. I’ll have more blog posts in the coming days/weeks once I get photos downloaded and am caught up here at home. I still need to write up the secon portion of our hike in Davy Crockett NF from a few weeks ago, too. Excellent sighting!! It’s funny how we remember things how we want to and then we go back and say oh yes, that’s why. We understand! What I remember of my time visiting NYC with a friend was lots of cool restaurants, mixings of people, the beautiful botanic garden and the lack of sleep because it was so so so so noisy. I can’t imagine living with that background sound continuously. I was so ready to get back out of a big city and into a lot more natural area.